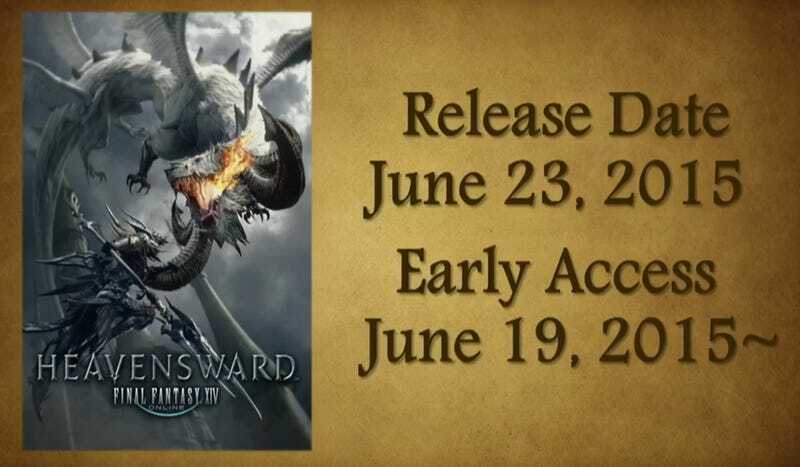 Missing the original spring 2015 release window by a few weeks, the Heavensward expansion for Final Fantasy XIV arrives on PC, PlayStation 3, PlayStation 4 and now Mac on June 23. The release date was announced during the game's panel at PAX East in Boston, along with the news that Mac port experts Transgaming would be bringing the game to MacOS day and date with the expansion's release on PlayStations and PC. The expansion pack adds three more classes to the game, raises the level cap to 60 from 50 and allows players to explore Northern Eorzea—including a homage to Final Fantasy VI's flying continent—on brand-new airborne mounts. Players who preorder the game—preorders open on March 16—will earn four days of early access to the new content. To help players prepare for the upcoming release, a nine-minute benchmark program will be released next month, featuring flying mounts and an extremely impressive sky whale, which I've been told is the new Primal, Bismarck.